"That's my picture in there," exclaimed Christian Bautista, whose popularity in Indonesia has helped raise funds for the building of a church in the city of Manado. 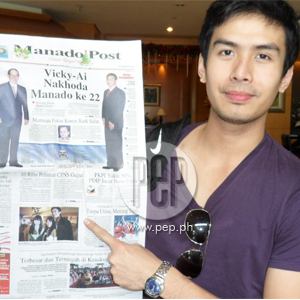 Christian Bautista helped raise USD37, 000 for charity work in Manado, Indonesia. Last December 7, the Kapamilya star was invited by Shinta Sutiani to perform for an event that would collect funds for the building of St. Ignatius Church in Manado, capital of the North Sulawesi province. Sixty-five percent of the city's population are Catholics. Tickets were sold out at $30, but it was the bid that made the collection reach the two-digit amount. For his last song "The Way You Look At Me," the balladeer's biggest hit in Indonesia, the ladies' pledges went from USD500 to USD1,000. The show's success earned a story on the front page of The Manado Post the following day.